The Cleveland Cavaliers have won an NBA Championship and thereby released our city from decades of cursed sports team. The Republican National Convention is almost upon us, an event which seems likely to bring our beloved city to ruin. It is not difficult to see how there might be conflicts between these two narratives. Conflict, in fact, seems to be what this area runs on - a mess of contradictions that make its inhabitants who we are. And we are wounded creatures of habit, capable of maintaining a cautious optimism to bear us through the crushing circumstances of failure and loss that govern both our sports teams and our regional economy. We build art from nothing or from discarded materials in an effort to improve our surroundings. We try to build new neighborhoods from the hollow facades of our history. As part of Cleveland's efforts to welcome the aforementioned Republicans, banners have been hung all over the city that provide "fun facts" about the city's history - first stoplight, birth of Superman, and so on. They're strategically placed near historic buildings or places that they refer to, where possible. When not possible, they're placed where people are sure to see them. 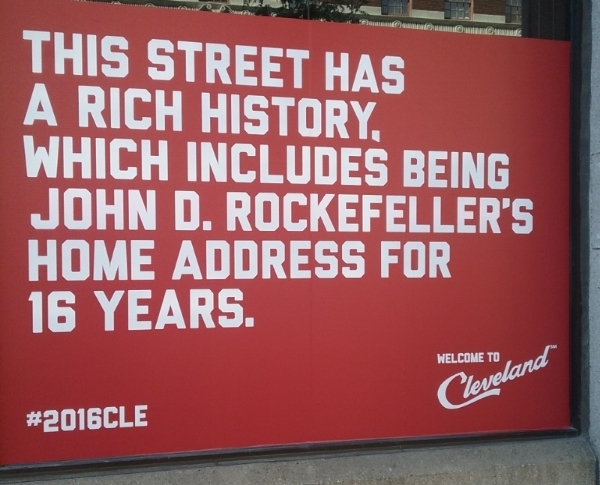 One example of this is pictured below - this banner, which references John D. Rockefeller, is part of a line of banners that cover windows of vacant shops on a once-prominent street downtown, near the central Public Square and many places convention-goers are sure to be. This street, once the home to Cleveland's richest and most glorious people, homes, and commerce, now full of vacant shops and buildings whose windows have long been smashed out. This street that is now lined by positive reminders of the past and near some of the city's finest reclamation projects of the last ten years or so - the abandoned bank turned into a destination grocery store, the department store turned into a casino, etc. It can never be said that Clevelanders give up easily. And so, It is my faint hope that, when the convention is over and the visitors head home, they will think of this city as a place that is using its history to transform its present and shape its future. Until then... we wait.